YouTube is getting more and more popular these days, and many people would download YouTube video for offline enjoyment. There is a great chance that the format of videos downloaded from YouTube does not meet people’s requirement, therefore people might consider converting YouTube video to other video formats that meet their requirement, such as WMV video format. In most cases, videos downloaded from YouTube are contained in FLV format, and sometimes in MP4 format. People who use Windows Media Player quite often would get frustrated when Windows Media Player fails to play back YouTube Videos after downloaded. It is because the formats of YouTube videos are incompatible with Windows Media Player, and the best video format for Windows Media Player is WMV. In this regard, people would choose to convert YouTube videos to WMV with a YouTube to WMV converter. It makes sense that we need to make use of a YouTube to WMV converter to convert YouTube video to WMV. Here we take a close look at a third-party YouTube to WMV converter before we switch to a YouTube to WMV online converter. This third-party YouTube video converter is Leawo Video Converter, a professional video converter that is able to convert video and audio files between 180+ formats including MP4, MOV, MKV, FLV, AVI, MP3, AC3, AAC, WAV, etc. The video converter can also convert YouTube video to other formats including WMV, so it can be regarded as a YouTube video to WMV converter. The program has a Mac counterpart as well. Download and install the right version of Leawo Video Converter on your computer, and kick off the program to enter the home page to get ready for the YouTube video to WMV conversion process. On the home page of the program, you will see four modules at the top menu bar. 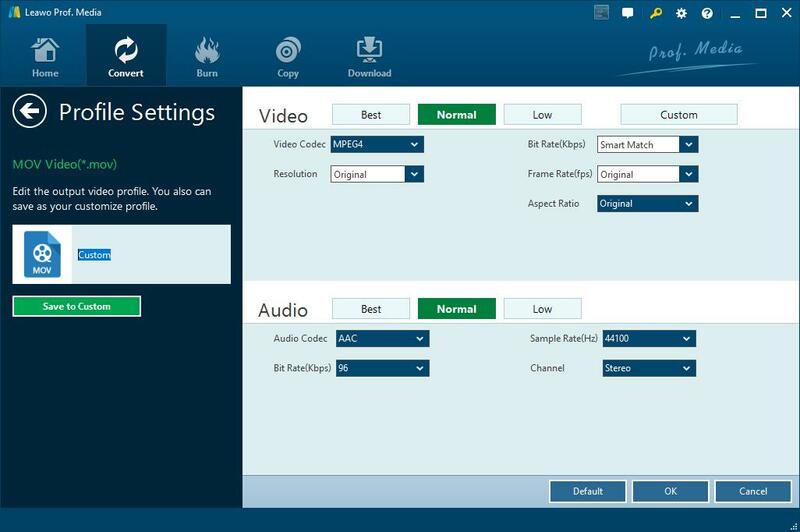 Click “Convert” module to enter the main interface of Leawo Video Converter where you can either click “Add Video” button to browse and choose source YouTube videos for importing or directly drag and drop source files into the program. Click a drop-down box next to “Add Photo” button, and choose “Change” to enter the profile panel where you need to choose “WMV Video” under “Format > Common Video” column. Note: You can adjust WMV parameters as well after you set WMV as output video format by clicking “Edit” instead of “Change” on the drop-down box. Detailed parameters are adjustable like Video Quality, Video Codec, Video Resolution, Bit Rate, Frame Rate, Aspect Ratio, Audio Quality, Audio Codec, Bit Rate, Sample Rate, and Channel. After you are returned to the main interface, click the green “Convert” button to set the output directory under “Save to” box in pop-up sidebar, and then click the other “Convert” button at the bottom to start to convert YouTube video to WMV. It will soon complete conversion process. Apart from a third-party video converter, an online video converter can be utilized for converting YouTube to WMV. There are of course many online video converters on the internet. Choosing a proper YouTube to WMV converter online is a challenging job, but here I am going to make things simple by introducing an eligible online YouTube to WMV converter to you. The online video converter I am to present is Zamzar. 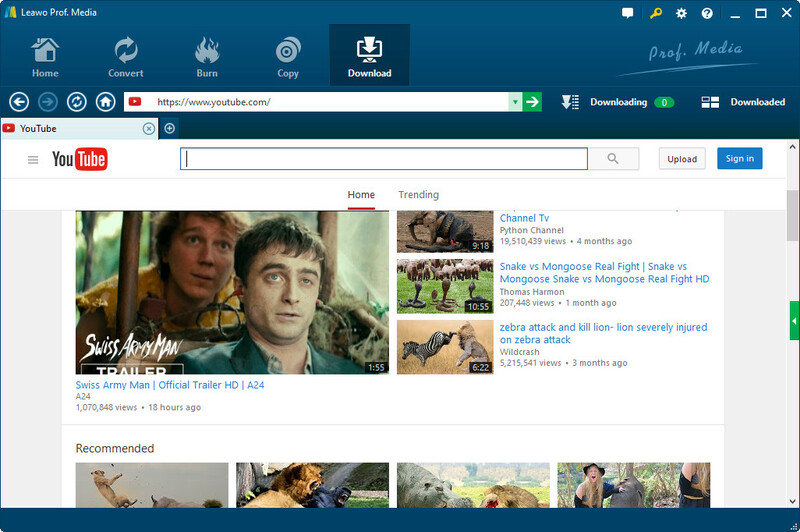 Check out the following to convert YouTube to WMV online free. Step 2. Choose “wmv” under the “convert to” list. After the process completes, you will receive an email. You can download the converted result now in WMV video format from the attachment. Many people might have no idea how to download videos from YouTube. To download YouTube videos, you need a YouTube video downloader. 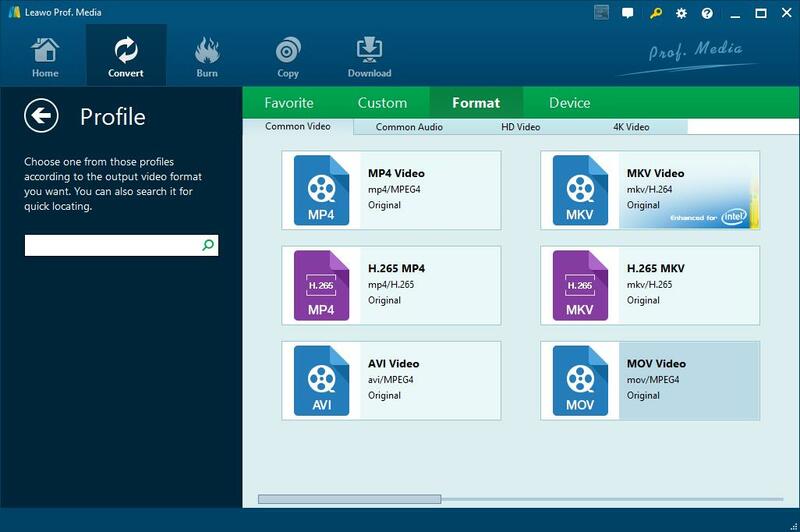 Here a video downloader from Leawo Software is introduced. The name of the program is Leawo Video Downloader. The downloader allows people to download videos from more than 100 video-sharing sites, including YouTube, Facebook, AOL, Dailymotion, etc. Download and install Leawo Video Downloader on your computer, and kick off the program to enter the home page. Click “Download” tab at the top to enter the downloading panel where you need to paste URL of source video into the address box, and then click the green right arrow icon to load source video. Click the little green triangle icon at the right to show a panel where all videos available for download are listed. Under each video file, you can see the video length, video size, and video format. Choose one(s) and click “Download” icon to add video(s) to downloading queue. Under ‘Downloading” button, you can check the downloading process. If necessary, you can pause the downloading process. After downloading process completes, you can find the downloaded video files under “Downloaded” button. See? No matter what video converter you are using, third-party YouTube to WMV video converter or online YouTube to WMV converter, you can successfully convert YouTube videos to WMV after you download YouTude videos with a YouTube Video downloader. Both ways can work out. But if we have to single out a better one, converting YouTube videos to WMV with the third-party YouTube to WMV video converter (Leawo Video Converter) is better as it does not require video uploading and downloading, and the whole process can be done offline.